It was a joy to get to meet and hear from Patricia de Nicolaï who is founder of Nicolaï, Créateur de Parfum and president of the Osmothèque (the perfume conservatory and museum in Versailles). Patricia is a thoroughly lovely lady who is extremely gracious and very quick to laugh. She is also incredibly interesting. Early on in her career she came up against a lot of gender discrimination in the perfume industry, not to mention discouragement from her own family – who just happen to be related to the Guerlain dynasty. Event Organiser Lila Das Gupta, asked the questions (as did some of those in attendance) and while the following may not be verbatim, it is a pretty good approximation of what was said. Patricia: “I didn’t grow up wanting to become a perfumer because I didn’t know that was an option for me. My mother was the grand-daughter of Pierre-François Pascal Guerlain but my parents didn’t have any involvement in the perfume business. I wanted to become a doctor and studied chemistry for 2 years after which I decided to change to a different school (university). It was a case of destiny intervening. I went to the library and looked through this huge book which had details of all the different schools. On the very last page was a school of perfumery (ISIPCA) and it had even been founded by Jean-Jacques Guerlain! I decided instantly that this was the where I wanted to study. Each summer I would take internships in different sectors of the industry, such as marketing and production, but when I worked in the laboratory I knew that was what I wanted to do. Many people discouraged me from becoming a perfumer. It was the early 80s and at that time it was very rare for a woman to be a perfumer, particularly in the big companies like IFF. It was also a lot of hard work. After finishing school it would still take 3-4 years to become a perfumer and I was told “You may not have the talent for it”. When I got a summer job in evaluation at Firmenich they were impressed with me and said to come back in a year or two when they would give me a job. However when I went back, I was told by the man in charge that they didn’t want a woman on the team. It is very different now though, as it is in all areas of business. Lila: “Luca Turin gave a glowing review of New York in Perfumes: The Guide”. “Smelling New York as I write this, eighteen years after its release is like meeting an old high school teacher who had a decisive influence on my life…New York’s exquisite balance between resinous orange, powdery vanilla and salubrious woods, shimmers from moment to moment always comfortable but never dark, always present but never loud. It is one of the greatest masculines ever, and probably the one would save if the house burned down. Reader, I wore it for a decade”. I am very busy, especially as my perfume company is completely independent. We create and produce our products and sell them in our own shops. This way I have fewer constraints. At one point we had someone else produce our candles, but we weren’t satisfied with them. 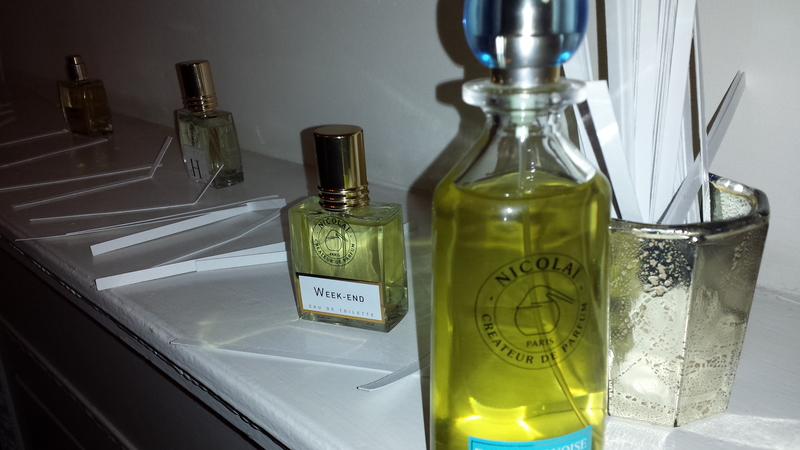 We got to try what will become the next Nicolai fragrance, which is yet unnamed. It opened very sweet and fruity, which made it seem very current, but Patricia told us that it was actually based on a tobacco accord. Lastly, I would just like to mention two fragrances that weren’t available on the evening and that are Weekend à Deauville and Le Temps d’Une Fete, the latter has a fantastic narcissus note and is a spring staple for many avid perfumistas. Have you tried any perfumes by Patricia de Nicolaï ? If so, what are thoughts? Do you have a favourite? This entry was posted in By Tara, Guerlain, Interview, Parfums Nicolai and tagged Guerlain, ISIPCA, Lila das Gupta, Lonfon, Osmothèque, Patricia de Nicolaï, Perfume, Perfume Lovers London, Perfumer. Bookmark the permalink. Sandra, I really appreciated how open and forthcoming she was about the difficulties she’d gone through. I hope you manage to find a perfume of her’s that suits you. I am SO jealous! 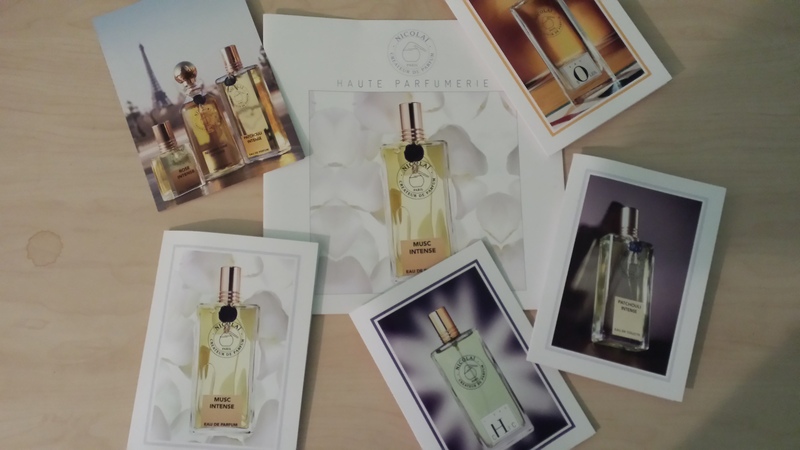 You got to meet Patricia de Nicolai and hear her talk about perfumes. 🙂 It sounds like a great time and I really wish I could have been there. Reading about it though is the next best thing. I personally like the line and have several bottles (Weekend among them) and I’m very grateful for the normal pricing and size of bottles they have. Ines, it’s definitely a perfumista-friendly line in terms of pricing and bottle sizes. Patricia mentioned after the talk that they had to drop “à Deauville” from Weekend because the town objected to them using it without making some kind of payment, which is a shame. Thank you for sharing the experience! The PDN perfume I absolutely love is New York. Nothing to add on LT’s review, I think it is a masterpiece, no less!!!! It’s the only fragrance me and my husband share, and it seems it is a favorite for us both. I haven’t had much luck with the other PDN’s fragrances, but you made me curious about number one. Which is your favorite from the line? You’re very welcome, Zazie! It was a pleasure to be able to go and share it with you. I would say that New York is also my current favourite from the line. I think it would smell amazing on a guy but ti’s easily unisex. I’d like to try L’Temp d’Une Fete again as last time I tested it a few years back somethng in the base didn’t agree with me. Hopefully that might have changed since because I adore the narcissus. 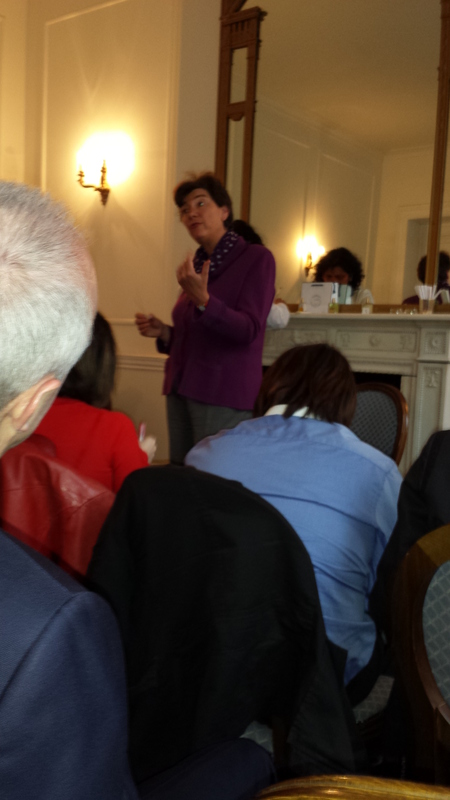 Excellent account of a fascinating night – have you ever thought of becoming a court reporter? You are a natural! I was interested to learn that Patricia is involved with the Osmotheque. I must be honest and say I haven’t found a Nicolai perfume that really grabs me yet. Le Temps d’une Fete I so wanted to love, but the indolic aspect didn’t work on me. I have by no means tried the whole line though! Reading this interview has piqued my curiosity to explore the house some more. Ha ha! I’ll remember the court reporter option in case I ever have to change jobs. I have to say though that my shorthand notes only make sense as an aide-mémoire. I looked back at my Malle notes and they now make no sense whatsoever. Anyway, I’m the same when it comes to Le Temps d’une Fete. I so wanted to love it and did so for a while to the point where it was full bottle worthy, but then it changed. Not sure if indoles were the problem. I’d like to go to her shop in Fulham at some point and re-try. I have a bottle of Weekend. I like the fact that they are reasonably priced. It’s interesting that her family did not support her efforts. Bravo to her for going ahead and doing it anyway. I know, I admire her so much for persevering despite the lack of encouragement from her family. Thank goodness her husband was the opposite. The perfumes are very reasonably priced, especially for a niche brand these days. A great peak behind the scenes of a perfumer’s life. Thank you. Thanks for reading, David. Glad you enjoyed it. This is wonderful Tara. I love reading about Patricia de Nicolai. She’s an inspiration. Number One: ‘ … not interesting, but he [J-J Guerlain] liked it’. This is also the gist of Luca Turin’s review of Number One. It seems like a contradiction, but you know – I can sort of see what they mean. Number One is a bit of an enigma for me. She’s like a woman who is attractive, and superbly dressed, but not strikingly beautiful. If you speak to her she is charming but left to herself she is reserved and self-sufficient. She doesn’t seem to have much to say and she does not need you to like her. And yet you do. You want to spend time in her company, although it’s hard to say quite why. Like I say, an enigma. I wear Number One quite a bit and return to it often when the more obvious beauties of Sacrebleu and Le Temps pall. Thanks, annemarie. I agree that she’s very inspiring. I love your take on Number One. An enigma can keep your interest a lot longer than something that is obvious. Hi Tara! A great report – and very enlightening to learn that Ms. de Nicolai made her business happen on her own, with what sounds like the endorsement of only her husband. I just assumed that she was encouraged by the Guerlain family, as it would seem very natural for them to do so. As for her perfumes, I love and own Sacrebleu. I need to explore her other fragrances, especially after reading Zazie’s comment about New York!! I think you’d love New York, either on yourself or your hubby. Thank you very much for this Tara! As Vanessa says, you have a real talent for this kind of thing. Madame de Nicolai is a formidable woman, I enjoyed learning more about her. I love Weekend and Sacrebleu, but I really should get to know more of her work. I enjoyed learning more about her too. I didn’t realise she had such an interesting back-story. Hi Tara, thank you for the report. You really made me feel like I was there, and she sounds very sympathetic. Like Vanessa (and yourself? ), I too want to love her frags, but unfortunately haven’t yet found one that I more than merely like. I do think she touches on the problem herself; she can’t make something too original, because she needs to sell. I completely understand this, and find it very clever, but perhaps I do tend to like more ‘symfonic’ fragrances. Yes, you make a very valid point. Most of the fragrances are very well done and good quality but may not necessarily be stunning enough to capture your heart. I think Suzanne might be right about Sacrebleu though. She and B are both big fans of that one and it is definitely the most striking of the bunch. I would still like to spend some time with Weekend and Le Temps d’Une Fete to see if I can find one that is full bottle worthy for me. If I was attached no doubt I’d buy a bottle of New York in an instant! Tara, I so hope I’ll be able to come to a meet-up soon and see you again ! I’m happy you’re our reporter on site though. It’s a shame I knew about the brand, but never really tested or investigated the perfumes any further. Well, I defnitely need to change that situation very soon, because PdN sounds so nice and “down-to-earth”. Exactly! For a niche brand especially, it is very down to earth (like its creator). I think it’s great she has control by owning her own shops but obviously we would find it easier to explore the line if it were available in department stores or perfumeries. I would love for you come to another meet-up soon, it would be so good to see you! Fab write up Tara! Patricia sounds like a very interesting character indeed. I must admit that I don’t have much experience with the PdN line but you have piqued my interest! Have you ever visited the London store? It’s sooooooo tiny! I haven’t visited the London store but I want to. I have heard it’s so tiny you can easily miss it. I’ll admit I was surprised to find out how unsupportive her extended family was, that’s a shame. Hopefully they’ve come around now. And her husband deserves major kudos for his role. I haven’t tried the entire PdN line, although I own and love LTdF. Like others have mentioned, now I want to remedy that. New York sounds right up my alley. It was surprising wasn’t it? Before Patricia, being a perfumer was obviously seen as the preserve of the Guerlain men. Her husband was really the impetus for starting the company. He said if they didn’t do it she’d probably find it very hard to get back into the perfume industry after taking a career break to have children. The narcissus in Le Temp d’Une Fete is so wonderful I hope it works for me next time I try it. Fingers crossed New York is a hit with you when you get to test it. Thank you Tara for such an interesting insight – this is one of my all-time favourite lines. I have quite a few (you can buy several bottles for the price of most niche perfumes, so it never seems like an extravagance to add another one to my cluster!). I find they grow on me, ie although initially they may not seem especially original, as I wear them all the nuances and twists emerge and really there are no equivalents. For example the musk, which seems intitially straightforward, has a lovely pear liquor note running through it, together with light florals. A favourite has always been Juste une Reve, but this spring I have been wearing Weekend a lot! Thanks for sharing why you love the line so much. I can well imagine the compositions growing on you over time with different aspects coming to your attention. Lila mentioned that the musc is very wearable and I look forward to testing my sample of that one. I will look out for the pear liquor! Well said, Alice! I think we sometimes underestimate the value of wearability. What good is it if you have a stunning perfume in your collection but you rarely actually wear it? So many perfumers also put all their effort into that first sniff to capture people’s attention/money and don’t bother about the development. Thank you for sharing this! She sounds lovely. You’re very welcome! She really is a lovely lady.